Two years after the spectacular success of Beijing Olympics, China dazzled the world once again by unveiling the 16th Asian Games with a spell-binding opening ceremony in which water was the overwhelming theme and athletes were ushered in a unique boat parade on Pearl River. 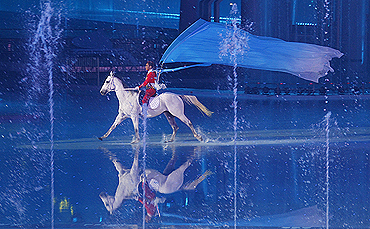 The theme was water and the main part of the ceremony was held at Hai Xinsha, an island located on China's third longest river, which is the life-giver to the southern part of the world's most populous nation. The four-and-a-half-hour ceremony started with trademark fireworks and the 37,000 capacity crowd was up on its feet when 1320 artists from the city's oldest kung fu school descended with giant LED screens in the backdrop. 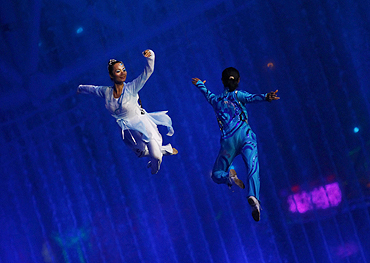 The mesmerisingly choreographed act had the artists performing breathtaking acrobatics while being several feet above the ground. The LED screens flashed the cityscapes and the artists formed formations to look like eagles flying through the sky. The ceremony was unique in more ways than one as it was not held in the main stadium of any multi-discipline sports spectacle as is the custom. The Hainixia island, which had an arena specifically built for the purpose, was the venue and it sat on a river that snakes through this sprawling city and at 2300 kms is the third longest in the country. 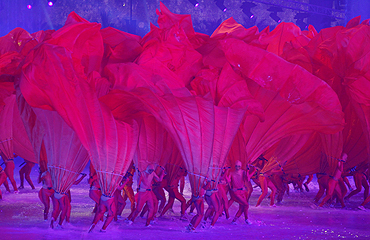 With the performing area composed of a fixed stage that could insert and release water and which could be elevated in the water, the stage was set for an amazing display of colour and dazzle that took the spectators' breath away in the 30,000-seater arena which was completed only two months ago. Circular water channel and four groups of sail-shaped LED screens which were made up of world's largest hanging LED screens -- 83m in height and 36m in width. With the tall, well-lit skyscrapers of the city acting as the backdrop, Guangzhou gave a rousing welcome to the athletes who would strive for medals from Saturday. 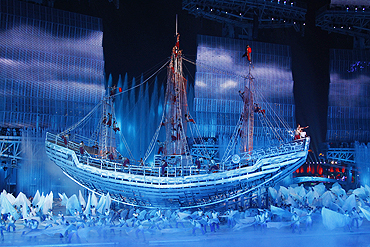 The decorated boats, 45 in all and representing all the countries and regions taking part in the Games, set sail to the song Happy Song All The Way along the River with performers lining up both the banks cheering them amid drum beats and local music. The 75-minute long athletes and officials' boat ride started at the White Swan Bay and ended at the Haixinsha Island with the floats sporting various colours. The Indian athletes boarded their boat at the Taigucang Dock along with those of 13 other nations while the Zhoutouzui Dock and the Fangcun Dock were used for the others to take the ride from on the river, which is the third-longest in China. The boats stopped at the Xidi and Tianzi Dock, where an operatic performance highlighting the Guangzhou culture took place, before halting at three more places. 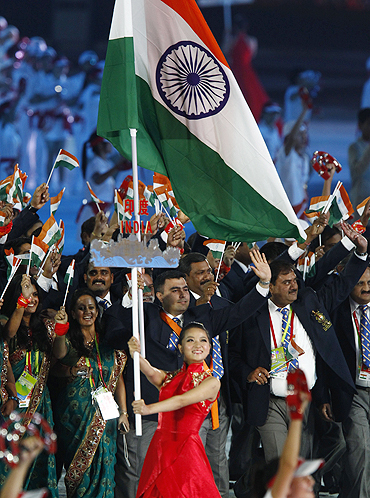 After much confusion over who would be the flag-bearer, the original choice -- ace shooter Gagan Narang -- led the 671-strong delegation of Indian athletes into the arena. The men were dressed in traditional blue blazers while the women in the contingent wore purple sarees for the occasion. 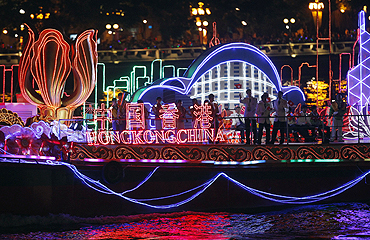 The athletes' boat parade was as colourful as it could get with artists on both sides of the river putting on a cultural extravaganza under the Dazhong Memorial Arch. While on their way to the stadium, the athletes were also treated to a fashion show and dance performances held on the banks on the river. A folk variety show and percussion music welcomed them before they disembarked at the Haixinsha Dock to the cheers of the welcoming group. The Olympic Council of Asia's boat also pulled in to the dock before the officials got off it amid joyous music and a Guard of Honour. The spectators, with props handed over to them on entering the arena, started interacting with the performers. Games mascot Xi Yangyang, the five goats, showed up running on the stage. 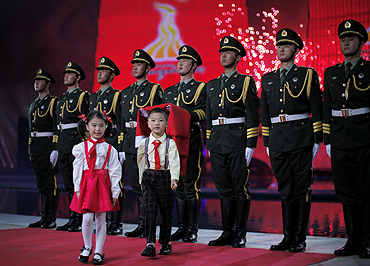 Chinese premier Wen Jiabao and Olympic Council of Asia President Sheikh Ahmad Al-Fahad Al-Sabah then entered the arena to the strains of the military band of the Chinese army. The raising of the host country's flag and the singing of China's national anthem were gone through before an art performance Setting Sail followed by dazzling fireworks from the Guangzhou Tower. 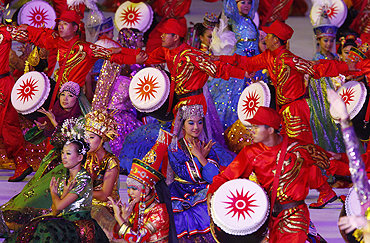 The virtues of the Pearl River were highlighted by a foot-tapping dance-music show before the arena reverberated with the sound of over 500 drums. The ceremony of converging water and the invitation from the City of Flowers (Guangzhou) followed with short videos being shown on sail-shaped screens. The theme song Sun Rises from the East was a prelude to the entry of the athletes into the arena with the military band striking its notes. 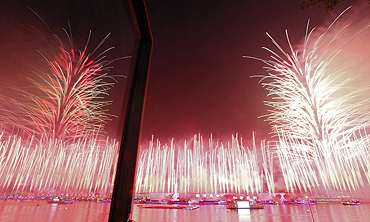 The Games Organising Committee chief Liu Peng and OCA chief Shaikh Al-Sabah delivered their opening speeches before Chinese PM declared the Games open to the accompaniment of fireworks. The formal part of the function commenced with the entry and raising of the OCA flag, and the playing of the OCA's anthem. 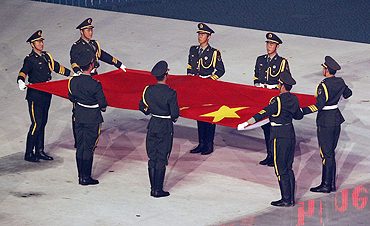 Athletes' and officials took the oath before the Games flame arrived. The cauldron lit, Guangzhou's night sky was then lit up by eye-catching fireworks.